Do you have a list? Not a grocery list or a to-do list, but a list of places you want to visit? I have always had such a list, and for a long time Chicago was somewhere towards the middle – it had always been put off when another trip to NY or NJ came up or when some family member in an obscure part of ATL or FL requested a visit. Regardless of how many times it had been passed over, I knew I would some day set eyes on Chicago. What I did not know, was that I would fall in love – hard! Sure, I had listened to others gush about it, people would say, “Oh, it’s gorgeous”, or “Picture NY but cleaner” and I would nod and smile at their description. But these people failed to mention that this city is so much more than a metropolitan shadow of the Big Apple! Chicago is not the middle child of the US, it is it’s own personality with its own wonderful and exciting list of attributes to bring to the travel table. So much so, I kind of don’t even know where to start…Who am I kidding, of course I know where to start, we start with the food! Some cities don’t care much about what they eat, there might be one decent restaurant within a 50 mile radius if you’re lucky – thankfully Chicago is not one of those cities. These people do more than care about what they eat, they live it! Eating is not something that is talked about or planned for it’s just done! From the very start of any given day in Chicago you can prepare to be wowed! I had one of the best cups of coffee of my lifetime in this city, and I am not a Foldger’s kind of girl so that means a lot! That is how early their passion for the delicious starts in Chicago – your morning cup. It will be delicious, bold if you want it and if you walk into Intelligentsia your cappuccino will even have foam art! Yea, that’s just how Chicago rolls – they offer up cuisine from all over the world and serve it in restaurants, bars, cafes and on the streets with a huge smile of pride on their faces. I kid you not, I did not get bad service in any establishment the whole time I was there. I think I may have covered the global menu in food in just a week. From Chinese to an almost Ethiopian encounter (we had to leave and didn’t have time – quite sad) to encased meats the likes no Miamian has ever seen, Spanish tapas, diner food, Indian, you name it, I ate it. Needless to say I came back one bloated Betty, but hey it was all worth it for my readers to taste vicariously through me. Thankfully, with all the sites to see in Chicago you know working up an appetite was not hard to do. I have noticed that in places where the winters are harsh and the summers are short people really love to be outside, Chicago is no exception. The second the sun beats down a little more and the temperatures head up into the 60’s and 70’s these folks are hitting the streets and soaking it up. There are parks everywhere, concerts, historical tours, little patches of grass far and wide and so much to do and see! The great part about wanting to do stuff in Chicago is transit. Yes, a touchy subject here in SoFlo (we’re jealous of everyone who has it), the train system in Chicago makes life a gabillion times easier. From Wrigley Field to the airport the Blue Line and Red Line are a transportation fair ride – I thoroughly enjoyed this aspect of the city. I kind of had to, it made it so much easier to appreciate the history, architecture and art the city has to show you. From the Sears (I will not call it Willis) Tower to the Cloudgate (aka the bean) I pretty much walked around the city with my jaw on the floor. The skyscrapers are beautiful and the stories behind their creators and the history of the city make it even more amazing to learn about. The city has worked hard to keep itself afloat, almost literally actually. But it only made them stronger and more full of pride for their fair town. I’m in love, there is no doubt, I cannot wait to run back into the arms of this fair city, a city that feels like a town, and continue to get to know it. I want to eat at every fabulous and casual restaurant, I want to stare at every skyscraper and learn the ins and outs of their structure and history, and mostly I want to roam the streets and see where I end up. 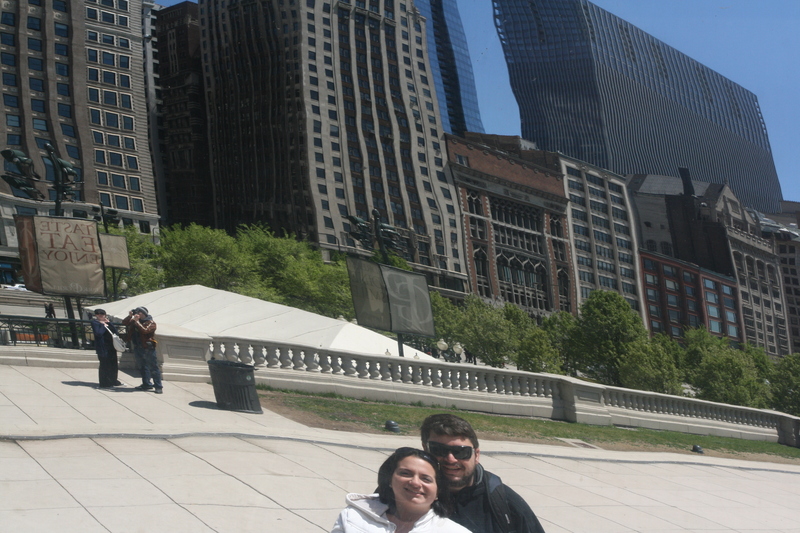 Chicago you are my love!